AJ Allmendinger’s career is coming full circle – albeit making left and right turns. Allmendinger, 31, will test an IndyCar for Penske Racing at Sebring International Raceway on Feb. 18 and 19. If the test is successful, Allmendinger will make his open-wheel debut for Penske Racing at Barber Motorsports Park on April 7. Sources told FOXSports.com that if everything goes according to plan and sponsorship can be acquired, Allmendinger will also run at Long Beach in preparation for the Indianapolis 500. “The first test is just to see how things go at Sebring,” Allmendinger said late Wednesday by phone. “It’s been seven years since I’ve been in one of those cars – and they’ve changed quite a bit. I know it won’t be easy. But I know I’ll be in the best possible equipment and I’ll have Will Power there – one of the fastest guys in the sport – to help me get up to speed. I’m really looking forward to it. At least Sebring is a track I know. Allmendinger has learned to cope with pressure over the past year. 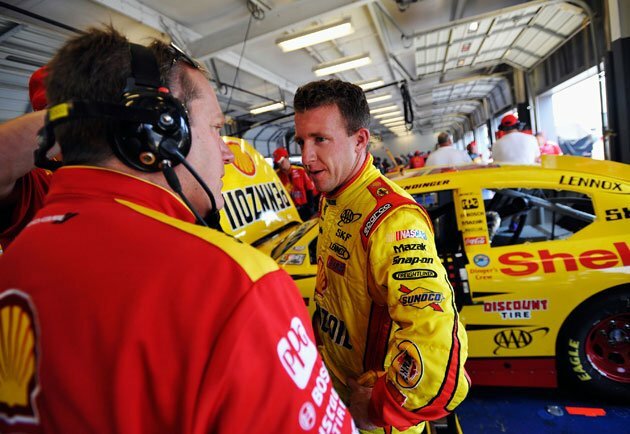 After working his way into the ride of a lifetime with Penske Racing’s Sprint Cup team, Allmendinger failed a drug test administered at Kentucky Speedway on June 29 and was suspended from competition at Daytona International Speedway on July 7. Upon completing NASCAR’s Road to Recovery, Allmendinger was reinstated Sept. 18, but Penske Racing released him from the No. 22 team Aug. 1. During the Charlotte Motor Speedway Media Tour last month, Penske said two of his stock car priorities were winning the Brickyard 400 and “kissing the bricks” at Indianapolis Motor Speedway and helping Allmendinger get back on the track. Before Allmendinger’s arrival with Red Bull in NASCAR at the end of the 2006 season, he was on the fast track in open wheel. After four races into what would be his final season in Champ Car, Allmendinger was recruited by Gerry Forsythe. He won the first three races with the team and two of the final six events to finish second in the point standings to Sebastian Bourdais. Allmendinger has never equaled his open-wheel success in stock cars. His only win since leaving Champ Car came in last year’s Rolex 24 at Daytona International Speedway. In his defense, until he joined Penske Racing in 2012, the equipment was just mediocre. Allmendinger posted five top-five finishes in 173 starts. His best finish was second at Martinsville Speedway last spring. Phoenix Racing’s James Finch was the first team owner to offer Allmendinger a Cup ride once he was cleared by NASCAR to drive. He competed in four of the final six races in the No. 51 Chevrolet and is expected to continue his run for Finch this season. On Jan. 27, Allmendinger finished third in the Rolex 24. Still, Allmendinger’s opportunity to repay Penske for his vote of confidence fuels the driver. “When you first walk into Penske Racing and see the Borg-Warner trophies and the helmets of all the Indy 500s he won, that’s what it’s all about,” Allmendinger said. “It would be a dream come true to run the Indy 500 with Roger Penske, but it all starts with Sebring – and that’s my focus.